I packed up (mostly) yesterday, and took care of errands. I spent way too long in the library looking for books on CD to play in the car. The library has about a dozen such Alphabet murder mysteries, and as many Cat murder mysteries. I know a lot of people love murder mysteries and thrillers, but I'm not one of them. Except for the #1 Ladies Detective Agency, which I find amusing in all sorts of ways. They have shelves of books about spirituality, but they don't appeal to me, either. And relatively few novels I find interesting. I settled on a Barbara Kingsolver, The Heart is a Lonely Hunter (by someone I can't remember, and it's in the car), the beginning two books of two separate kidlit series (Lemony Snicket and something else). Take care; I'll see you on the flip side. This evening, I decided to throw my bike a 4000 mile party of sorts. I baked some cookies to take to the folks at the bike shop, and also will freeze some to take on my road trip. Hey, they're oatmeal raisin! They're practically health food! I've really got the jitters about the trip, not about driving, because I've driven across the west a few times, and my car's in decent shape, and the roads are generally good this time of year. No, I'm worried about the biking. I'm worried that I will just be so much slower than everyone else that I'll be a problem for the guides. I'm a pretty slow rider, especially if there are uphill slopes involved. I'm also worried that I won't be able to ride the distances. And finally, I'm worried that I won't be able to ride the distances five days in a row. This is as close as I've ever come to doing something fairly athletic. I keep telling myself that the guides are in the business of taking care of folks on biking tours, and that they'll handle my minimal skills/abilities with grace and kindness. That's how it has been when I've gone on rafting trips, and guides have taught me rafting basics and such. They're always really good at making people feel good about their learning and helping people have fun. I keep telling myself that if it takes three or four hours to ride 35 miles, that's probably okay. And still I have the jitters. I should have gone out riding in the rain a bit, to prepare. I should have ridden more. I tend to get nervous just before things, and then once I get started, I have a really good time and I settle in and things work out. So I keep telling myself that it will work out and things will be fine. I'm either going to have the vacation of a lifetime, or not. But for now, I have the jitters. I cleaned up my bike this morning, in hopes that the bike shop I like will be open and have my tire in stock. And then I took a picture of the rear tire part that looks like a flat waiting to happen. I have to admit, it's very cool seeing a bit of how the tire is constructed, with all this cloth of some sort. The tires look like they have some rubber stuff still, so they're maybe not as close to a flat as I thought last night, but I still don't think I'd feel very confident riding around on them. My thanks to Brian for the Sheldon Brown suggestion. As always, it's good to learn more about bikes! I went out to dinner tonight with a couple friends. Along the way, we were talking about biking, since I'd gone for a 51 mile ride today. We had a really good pizza, out in the middle of a nearby country, in a barn. When they dropped me off, Z asked to see my bike, so I got it out of the car to show her. What's that on the tire? 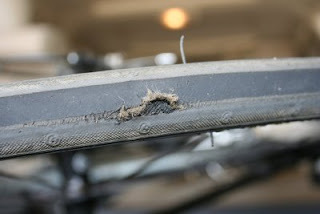 A bald spot, about an inch long, most of the width of the tread, on the back tire. And look, a smaller balding spot on the front tire, but to the side more. So did I mention that I took a 51 mile ride today? And not a single problem. And then there's a bald spot tonight, when the bike is safely in the garage resting with the other bike. There's a bald spot today, when I have tomorrow (or Tuesday if the shops are closed tomorrow) to get new tires put on before I leave on my long trip on Wednesday morning. Yes, that long trip, the one where I bike for 5 days in Yellowstone. Sometimes, I live a charmed life. It's like I'm in a Buster Keaton movie with the wall falling around me, and I'm blithely standing just where the window opening comes down. I have about 4000 miles on these tires, which seems pretty much in line with what bike tires get (from what I've read). I'm thinking I'll give the bike a nice bath and lube tomorrow morning, then if I can get new tires, I'll take a short ride. I love the idea of starting with Pearl, but it would have to be in translation. And a medievel drama is also a GREAT idea! And the Morte Arthur! YAY! And the Art of Death works! You guys rock my world! -Fox's Book of Martyrs: Gardner and what's his name. Sermons, Donne and Andrews? Others? Artes Moriendi--Jeremy Taylor, The Rules and Exercises of Holy Dying, would be a late (1651) example. Poet's Corner, Shakespeare's gravesite, others? Donne's famous shroud pic, others? I really like the way that starting with Arthur and ending with Charles sort of rounds things out. I'd love some help nailing down some more specifics, and also theories on death, grieving, suicide, murder... Maybe some Foucault on punishment? I'm also thinking about some assignments. I'm thinking about a short assignment that asks students to either go to a cemetary and look at how monuments, etc work, how things are laid out, how families are put together, and so forth, OR, to look at a religious practice (preferably their own) and see how it understands death and helps the survivors through. This seminar will explore early modern English experiences of and responses to death in a variety of genres, including poetry, drama, narrative, biography, graphic images, and funerary monuments. We'll read sections of David Cressy's Birth, Marriage and Death as well as texts on suicide, murder (including domestic violence), and legal issues. Students will be required to present on a critical or historical article related to the course, to write a short essay on one of the texts, to find and present on a related early modern text not on the syllabus (through EEBO), and to write a substantial research paper on a topic related to the course. Last fall, as my senior seminar was finishing, I had a short chat about what senior seminar I might offer this fall. I was thinking of a seminar on Marlowe, and mentioned that. But the students really liked the idea of doing something more thematic, and when one of them mentioned a seminar on death (in early modern England, if I'm teaching it), they all jumped on that bandwagon. And it seemed like a good idea at the time. Now, it's seeming less wonderful. I have some ideas, really. But before I share those, I'd like to open up the comments and see if folks have texts they'd teach for sure? I'm thinking of texts broadly. I'm game to look at art, maps, etc. I'm willing to take early modern from 1475-1660 or so. (I really don't want to get too far into the restoration, though.) I'm also looking to search and find stuff rather than order an anthology and just go from there. And I'm thinking of primary and secondary stuff. So here's the challenge: what would you teach and why? I took a couple days and went on a short visit. It's amazing how quickly being in another household, one with totally different concerns and activities, can take my mind of certain frustrations and concerns. It was especially good to be away a bit after the service on Friday. But then I came back. I got my first grade complaint of the semester. The student is complaining about an A-. S/he agrees that it's a fair numerical grade, but wants me to change it anyway. I just want to say, an A- is NOT going to keep you out of law school or whatever. It's not. Either it will be the lowest grade in your college career, in which case, your grades will rock, or it won't be the lowest grade in your college career. And even so, your gpa may rock. I don't get impatient with a request for an explanation. It's important for students to understand how grades are figured, and this one was politely worded. I sent back a note showing my numbers and math, and suggesting that the student check my math. But I do get impatient with the next step, the "please, please change my grade" part. And yes, I recognize that the student is probably worried about law school or whatever, and that a single grade can seem like a huge thing. But the grade is fairly figured and what the student earned. I'm worried about the bike trip. I haven't been on my bike in several days, and the weather is looking terrible. I was lazy today, partly because I'm just lazy, but partly because the winds were bad (supposedly gusting to 30mph). I get really tired of wind. There is no stupid child care! No hassles with the kid! I left it there, for them to feed. I set a new, personal bike speed record today. 40.1 mph down a steep hill. It occurs to me that things could be very ugly if I fell at that speed, still, it's pretty fun. But going up the hill was a whole heck of a lot slower. Look at this! 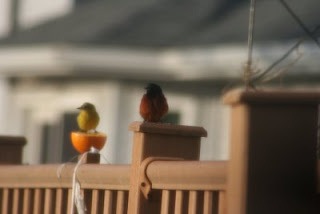 It's a pair or Orchard Orioles. (Well, I'm pretty sure. You can see how much darker this male is than the Baltimore Oriole pictures I posted before, and how much yellower the female is.) Sorry they aren't better pics. These two didn't stick around when I tried to move to the other side of the house to get a closer shot (without the screen in between.) I'm pretty sure it's not just a trick of the light, because a Baltimore Oriole flew in a moment later, and looked bright orange instead of dark like this one. I hope these two will come back again. Things are pretty exciting in the yard since I started putting out the orange halves. I've also got a female cardinal hanging about on occasion. I took my car in for an oil change yesterday. You know how when there's something wrong but it's just so stupid you haven't mentioned it before (for YEARS) and it's embarrassing to mention, and besides, you're not sure you can afford to get it fixed, and it doesn't really keep the car from working, so it's not a big deal? Yeah, for several years, my driver's side window has had just enough of an air leak to make an irritating noise at anything over 17 mph. This past winter, my friend noticed it while we were driving to go skiing. And other people have noticed it. I've noticed it, of course, and when it gets irritating enough, I jamb the fingers of my left hand up into the place where the window and rubber meet near the top of the window and stop the noise until my fingers start to hurt more than the noise is irritating. But since I'm heading out to Montana before long, I decided to ask about getting it fixed, with an asterisk about how if it were a lot of money, I'd rather just keep jambing my fingers there. The very nice car repair manager just wrote it down, like it was nothing, like I hadn't been too embarrassed to ask about the stupid thing for about five years, like I wasn't red with embarrassment. And then I sat in the waiting room and graded. I graded through an older woman who's taking a trip to Kansas soon, and I graded through a retired NWU librarian. And every time the very nice car repair manager walked through the area, I looked up hopefully. And then another woman came in, and turned up the TV, flipped open her magazine, and started talking on her phone, loudly, so she could be heard over Dr. Phil. So I graded through her, and finally the very nice car repair manager came and gave me the nod, and told me my car was ready, and they'd fixed the window, an easy adjustment of something called a "gusset." Meanwhile, though, in a miracle of grading, I'd finished most of the stack I'd brought (which had already been partially graded). And while I'm looking at the Thrasher, on and off, I'm also noticing the cluster of small, goldfinch-sized birds hanging onto the thistle feeder. I'm pretty sure I've seen these before, and that they're female goldfinches, but I had the book open anyway, so I looked, and no, they're way darker than the female goldfinches, and their breasts are strongly striped. Fortunately, on the same page as the goldfinch in my Petersons, are a couple of Pine Siskin pictures, so I'm pretty sure that's what they were. And I'm pretty sure they've been around before, but this is the first time I've identified them. The Brown-headed Cowbirds are back, too, as are the Rose-breasted Grosbeaks. I'm beginning to think it's spring, and if I get busy today, I may make it out of grading jail for the weekend! I was so excited because I saw the female oriole, or A female oriole, at any rate, on my feeder thingy. She's lovely, and way more orangy than I would have expected from the picture in my book. And as I was finishing taking a couple pictures of her (finished because she flew off), I saw another bird, a tiny, very blue bird. And through my mind ran "damn, that is one really blue bird." And then a long pause, before, "but not a Bluebird!" Not that Bluebirds aren't wonderful and loverly, but they don't come to the deck (probably because I don't put worms out for them). They're around, and there's a bluebird house down in the "prairie restoration area," but this was way more intensely blue. So I took a picture (glad that I still had my camera in hand) through the screened window. I took a couple before I moved around for a better view, but it flew off (because my having a better view means they can see me, and I'm probably scary). 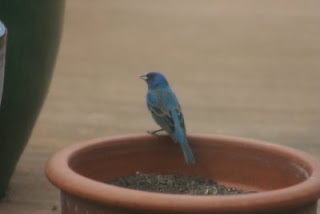 I'm pretty sure it's an Indigo Bunting. And if I had a life list, I'd be adding a new bird, because it's the first I've seen that I know of. It's been a good year for new birds in my yard! I've also been seeing a Red-winged Blackbird pair on the deck; they seem to be down in the valley below the house mostly, but come up to check on the snacking possibilities. It's all food all the time here at Chez Bardiac! 1) You are giving a final at 8am on the first day of finals. The final is in two parts, with one part (on bright pink paper) being an open notes/open book essay and the other being closed notes/book short answers (on green paper). During the final, which of the following will happen? (a) A student will use notes while writing the green part of the exam. (b) A student will come in half-way through the exam, complaining loudly. (c) Two students won't bring blue books. I've barely slept because I can't help thinking (and not just because I'm in grading jail). When my Dad died, I was sad, really sad. But somehow it didn't seem like the world had changed. When a colleague died a couple years ago now, I was sad, but it didn't seem like the world had changed. When my cousin's daughter died, I was sad, but it didn't seem like the world had changed. But lately, I suddenly realized that more and more people I know and love will die, more all the time, and many younger than I can imagine. I'm feeling rather maudlin about this, though I know it was true even though I hadn't figured it out before. And yes, I probably should have figured this out some years ago, but I guess I'm slow that way. Sometimes, my own idiocy is apparent to me in startling ways, though I'm sure most everyone else sees it all the time and wonders how it is I can manage to feed myself regularly and do the laundry. My world was hit by another departmental loss this past week. It was one of those things that happen sometimes, so rarely that it seems impossible, and so bad that it seems more than impossible. Once again, the universe proves how very fragile we all are. Those of us less close are muddling along. We've offered to grade; food is being shared. And I'm reminded once again how very wonderful my colleagues are. And I'm trying to get grading done. I've done a fair bit, and written the final exam for tomorrow. But if I can just buckle down, I'll be in good shape by tomorrow to finish up by my last final on Thursday. Edit: Here's Billy Collins reading "The Lanyard"
Once, I saw an oriole stop by my yard for a bit. It flew off, and I didn't see another that whole season. 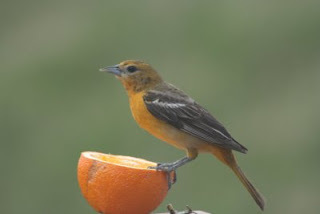 But I did realize that they might be around, so I looked into getting an oriole feeder. Finally, I just put a nail through a small piece of wood and then some picture hanger things, and used those to tie it to the deck railing, with the nail sticking up. Then I cut an orange, and smacked it onto the nail. And waited. 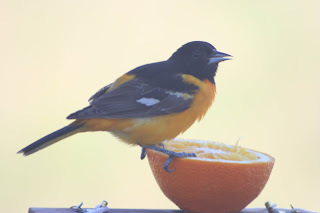 Yesterday, I saw my first oriole of the season. And today, someone's having quite the brunch out there. I'm thinking where there's one, there's likely a mate, but I haven't seen a bird the right size with female markings yet. All this brings up one of my basic difficulties with taking pictures. It's really hard to get a picture where you can see the oriole's black eye in his black feathered face. I keep ending up with either washed out looking colors where I can see the eye, or good oranges where I can't see the eye, depending on the camera setting. It WOULD be helpful if I could take a picture at a different angle, perhaps with darker background behind, but I'm guessing the oriole's cooperation would be involved. As it is, I poke my camera around the screen in the bedroom window, so everything is through a window. That isn't really bothersome when I look through, but when I take pictures that way, I notice the dirtiness of the window, and double reflection stuff and all. One of the great rewards of teaching first year writing courses is that sometimes students really do demonstrate that they've learned something. It may not be that I've taught them whatever, but somehow they've learned something. I ask my students to ask a real question for their research papers. But even so, most have a sense of what they think the answer is. I can tell that they've really learned something when towards the end of writing their paper they come talk to me about how to revise because they've totally changed their answer. It warms my cold, icy heart, it does! I was at a meeting yesterday wherein the Slogan Committee explained that they'd worked really hard and deserved for their slogan to be accepted. It wasn't. But as the discussion went on, I began to wonder why this committee was the Slogan Committee. Later, in another meeting, I learned a little more about the committee because there was discussion about appointments for the coming year. So this morning, walking in from the parking lot, I asked one of my colleagues who'd been at the Slogan meeting what s/he knew about the committee. Nothing, it turns out. It's like there's this whole world of special appointed folks who all know each other and all know what's with what, and who's who, but they don't realize that most of us (using only my colleague from the parking lot and I as a sample) don't have the same easy familiarity. I don't think my lack of knowledge comes from a lack of interest. I've served on this big committee, and on sub-committees for four years now. Unfortunately, the slogan committee was made up of people appointed for their skills in one arena, and that arena is far from writing or communication. So when they talked about how hard they'd worked, they sounded like a student who comes to you after getting a C on a revision and says that s/he made all the corrections you told him/her to, and why didn't they get an A? They looked at all your comments and made corrections! Like that student, they tinkered with individual words rather than re-vising in terms of seeing the problem anew or rethinking. They couldn't put aside the slogan they'd formed through hard work to think about how poorly it worked. It was like the famous saying that a camel is a horse made by committee. And that, writ large, pretty much says a lot about how NWU works: there's a committee, and it gets set in its ways and ideas, and can't revise, and its members get replaced only by people who've shown they fit in so well that they won't ask embarrassing questions. During the beginning weeks of my writing course, we read a couple works on liberal education at the beginning of the semester, listen to a talk by the dean, and the students write an essay about liberal education. For the past several weeks, my students have been working on their research papers. So yesterday, I gave them a quiz: I asked them to write a paragraph about how their work on the research paper has contributed to their liberal education. And you know what, they wrote good paragraphs. They dug out their notes and copies of the essays and referred to what we'd discussed earlier in the semester. Then most of them gave very specific examples of something they'd applied in working on their research paper, and talked about that in terms of their education. That is, they're pretty much all able to talk about some text in terms of their own experience in a specific way. Yay students! One of my colleagues gave me some flowers today in sympathy for my being on the Super Painful Committee next year. Sometimes I really like my colleagues for being decent humans. I went out for a ride today, planning to go about 20 miles, but about halfway back, I saw a friend, the partner of a colleague, so I turned around and rode with him. He rides a recumbent, which means a slower pace, and that was fine with me. The conversation was good, and the miles passed. I'm feeling a bit more confident today. I went 30 miles, slower because of riding with my friend, but it felt good, and my legs are tired but in a good way. When I was sitting around this evening, the Red Cross folks called to let me know that I can donate blood again this week. The blood donation person was understanding when I said I didn't want to make an appointment because I'm training for a bike ride and want to donate on a rainy day. I rode my bike 32 miles today. I went up the mile hill (not steep, but pretty long) and made it up, and then just rode. My legs are still attached, but they really wish they weren't. They'll be sad tomorrow. My trip to Yellowstone is in less than a month, and I'm worried. If a 32 mile ride (mostly flat) totally wipes my legs, how am I going to do a week of minimum 35 mile days where there are hills and stuff? And the long day of 75 miles? I've ridden 75 miles ONCE in my life. ONCE. And it wasn't pretty. I keep trying to tell myself that if I can't make it somewhere the sag wagon will pick me up, but where's the fun in that? And I really, really don't want to be the person who holds everyone else up and is a pain in the rear. I'm trying to reassure myself that if I can do 45 miles next weekend, and 55 the weekend after, things will work out. But that's a bit unrealistic, to add 20% or more a week for several weeks. I've decided not to run for re-election to a big committee thing, which means I also won't be on the other two related committees I'm on this year. I'll still be on a departmental (small job) committee, and probably as chair next year. So, I put in to run for a college committee, figuring the college committee and the small job committee would be about right. Then I got guilted into running for a departmental (big task) committee. Okay, still, I won't also be on a search, so I'll survive. Until yesterday, when the Super Painful Committee chair came by my office. She said one of our colleagues has refused to serve his/her rotation on the SPC, and that I'm in line. WTF! This colleague just came off of sabbatical, and is too tired to do his/her rotation? And that's that? S/he just gets a pass? And I'm the one nailed to fill in. And after my bike ride, I was feeling good until I got home to find the handyman in my garage. He was there to check the oil and stuff on the lawn mower and to sharpen the blades. But then he'd realized that the garage door doesn't work, so he'd started farting around with that. Yeah, because when he changed the spring, he put on one that was the wrong size and stretched, and now the proper one is on order at the garage door company. Why couldn't he call to check with me BEFORE coming? AND before screwing up the door further? The world would be a lot less frustrating if people would do their jobs and do them well, wouldn't it. There are neither enough expletives nor enough chocolate to make the next year good. To add insult to injury: Brach's changed the recipe of their malted milk balls. The chocolate's suddenly waxy and nasty, and the malt tastes like bad Whoppers malt. They used to be good, and now they're not, and I'm sad. We're facing another accreditation thing soon, so there's been lots of preparatory stuff happening. One of the things that happened at some point is that someone went around campus and asked people to talk about the NWU mission statement, and no one could. That statement was adopted at a time in the past when mission statements were supposed to say pretty much everything about a place, and tended to be a paragraph long. Now, of course, the fashion is for short, pithy statements. I don't tend to think highly of mission statements. Like gnomic statements (hi Classics Guy! ), they're short and pithy and pretty much that's their value. Or they're long and no one can actually remember them. Now, recognize that you're reading the words of someone who has trouble saying the pledge of allegiance, long before I get to the under god part, because I think we should pledge to the constitution rather than the flag. But, if I had my druthers, our mission would be "End patriarchy." But you know that would scare the dickens out of lots of people, right? Or maybe I could go with "Play bikes and read!" So what would your scary mission statement be?